Kybella vs CoolSculpting | Treatments for "Double Chin"
Are you troubled with “double chin” and wondering what your treatment options are? 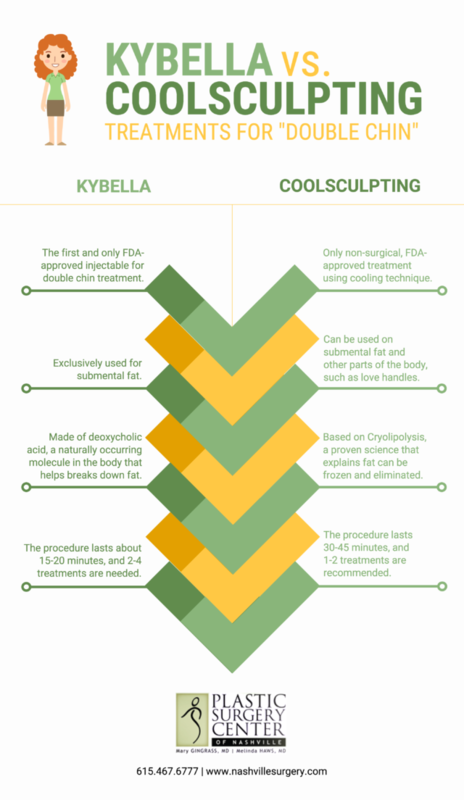 The Plastic Surgery Center of Nashville created this infographic comparing Kybella and CoolSculpting®. Kybella is an injectable treatment, while CoolSculpting uses controlled cooling. Both procedures are non-surgical options that can be used for the treatment of submental fat. For more information on either of these procedures, please contact Plastic Surgery Center of Nashville. The first and only FDA-approved injectable for double chin treatment. Exclusively used for submental fat. Made of deoxycholic acid, a naturally occurring molecule in the body that helps breaks down fat. The procedure lasts about 15-20 minutes, and 2-4 treatments are needed. Only non-surgical, FDA-approved treatment using cooling technique. Can be used on submental fat and other parts of the body, such as love handles. Based on Cryolipolysis, a proven science that explains fat can be frozen and eliminated. The procedure lasts 30-45 minutes, and 1-2 treatments are recommended.